Here’s what folks have been hearing since Friday night. 41 different North American pirate radio transmissions so far, a total of 163 loggings, and it’s not even Christmas yet! A big thank you to the operators for their shows, and the listeners for their reports. First observed two days ago, there seems to be a new (to us HF listeners, anyway) network of HF ditter CW transmissions. The purpose of this network, as well as who is operating it, is unknown. It is possible they are for propagation monitoring. Based on observations of listeners and propagation characteristics, it would appear that at least some of the transmissions are coming from North America, possibly the Central US. As you can see, thea transmission on each frequency begins right after the transmission on the previous frequency ends. 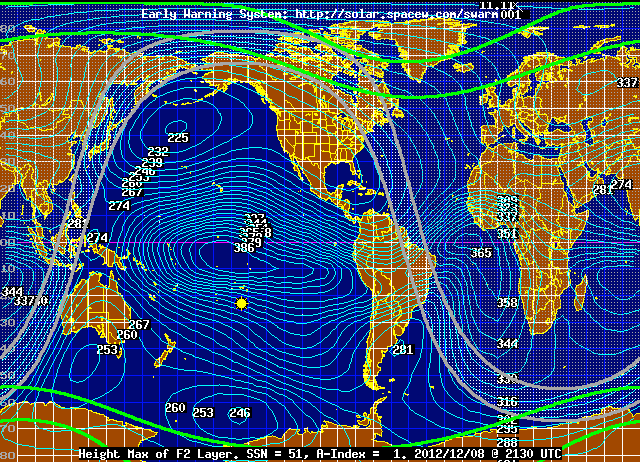 This data was obtained by running a netSDR receiver in 500 kHz wide I/Q capture mode. The resulting recording file was then demodulated at each frequency of interest. Each pulse (dit) is 130 milliseconds long, and they repeat every 6 seconds. Next, the demodulated signal for a ditter transmission on each of the above frequencies is shown magnified, to see the exact times of each transmission. I find that using an SDR is the easiest way, as you can observe a large portion of the spectrum at once. I use a 500 kHz wide view, and step through HF, looking for the periodic dits. But you can certainly use any radio. Note that the frequencies are all multiples of 25 kHz. They also sometimes occur in groups of three relatively associated frequencies. There are likely additional frequencies that have not yet been discovered. If you’re hearing any of these transmissions, or have discovered possible additional frequencies, please let us know with a comment!